Things change often around here. I don’t much like change in my life, but in my home? Yes, please! I can be sitting on my couch enjoying a magazine, see something cute, then BAM! I’m changing things again. Sometimes it’s a small area in my home, and sometimes it’s an entire room. This beach inspired vignette was one of the quickest changes yet! See, I have an arsenal of things just waiting to be used. Take these conch shells for instance. They have been sitting in a box labeled summer, and I just didn’t know what to do with them until today. Isn’t that a shame? Their beautiful curves and points. The largest one has special meaning…when Matt and I were in The Bahamas, we watched a live conch cooking demonstration. The chef blew a hole in the conch and took it out. I was expecting some grand show, but he simply held up the conch and explained that the conch was believed to be a natural aphrodisiac, and asked who would like to try it. My husband’s friend was the lucky recipient, and ate the slimy conch, and weirdo me asked if I could keep the shell. I asked the staff at our resort for some bleach and soaked it in the sink overnight. Now if that isn’t some serious work on vacay, I don’t know what is. But, every time I look at it, I think about our wonderful trip. So here I was sitting on my couch, flipping through the latest issue of All You Magazine, when I saw the cutest beach inspired vignette. I gasped…loudly. I thought…Holy Moly! I have a plant, I have a candle, I have shells!!!! I am so doing this! I’m pretty sure I threw my magazine across the room. I darted out to the garage and yanked open my summer box and pulled out my shells. A rush of beach memories hit me like a ton of bricks…or maybe shells. I was so happy to bring them back inside! I swiped everything off of the table and placed them there, then turned to my mantel. That ivy in the urn will work perfectly!!! Then I looked down at the remnants of what used to live on the table and decided the candle could stay. I grabbed a few of my favorite summer reads to elevate the ivy, and wala…beach inspired vignette! Isn’t it just perfect, and oh so beachy? And from such an unexpected place…my All You Magazine. When I came across the Easy Decorating section of this month’s issue, I was blown away by the colors. Then, down in the right hand corner, I saw the little vignette that had my heart singing. 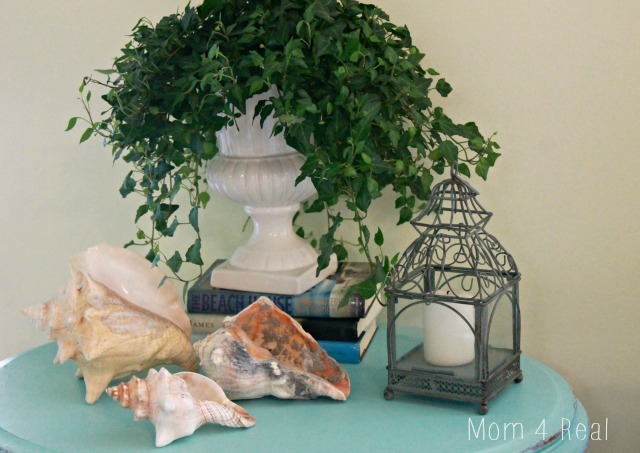 There was a sweet houseplant surrounded by seashells and a candle that filled me with the inspiration for my beach inspired vignette. All You is seriously one of my guilty pleasures. I grab the latest issue every time I go to Kroger. It’s so versatile and full of a crazy amount of information! This month alone, I have found recipes, a fabulous idea for throwing a birthday party, a super cool lighting idea for my patio, some tips for my hair, and even a few interesting health related articles. I think my favorite part of All You is all of the money saving advice it offers. There are easy to use tips on how to clean your house faster and cheaper, how to get out of debt, a fabulous shopping guide, and how to save money at the grocery store! There are even coupons that you can use! The magazine itself is less than $3, which is unheard of these days, a real bang for my buck! Don’t have a Kroger store in your area? 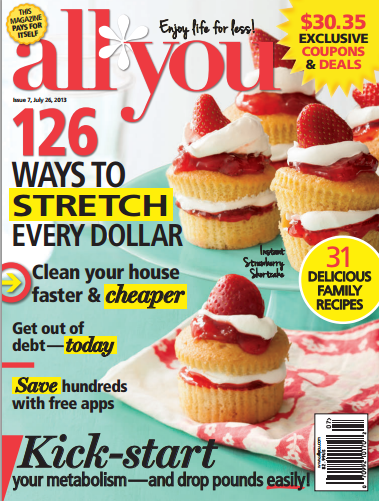 Check out the All You site where you can find the nearest store to purchase All You Magazine, as well find a money saving coupon to purchase your copy of All You Magazine. Up for a fun challenge? Hop over to the All You Facebook page and submit your project. You will have the chance to win a $25 Michael”s Gift Card. Do you read All You? Tell me what type of article you think would benefit you the most! I am going to do this! Thanks for the inspiration. ahhhhh so fresh and light and airy – i’m smitten! It looksk great. Love your house!! Way to hustle on nabbing the shell though. Those are spendy if you want to buy the real thing, and hard to find too! You did good girl. They make the table and are super cute to boot! 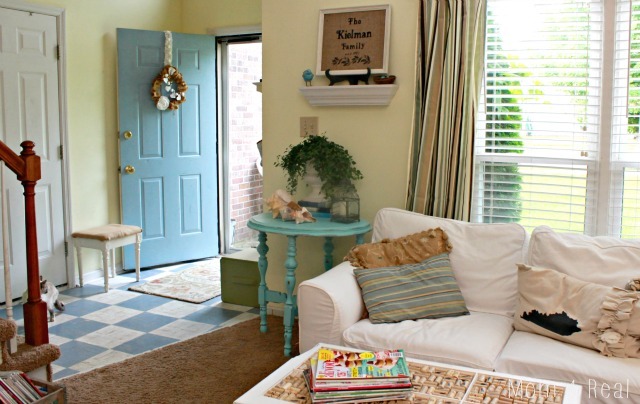 Love beachy decor and I love All You magazine! LOOKS GREAT ! I love your whole room! ALL YOU is awesome… I figure I get my money back on coupons alone! Thanks for sharing! 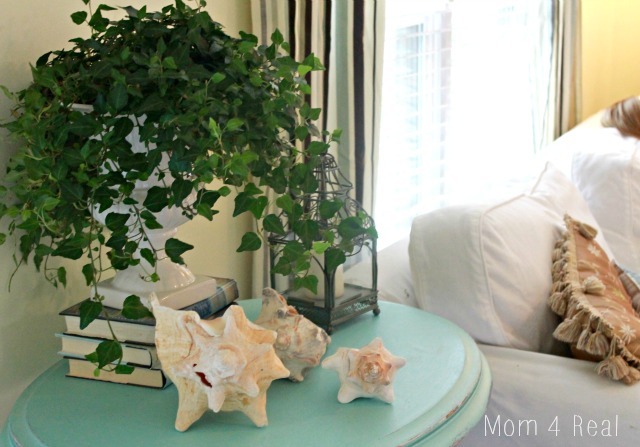 Love your beach vignette! Perfect for summer time! 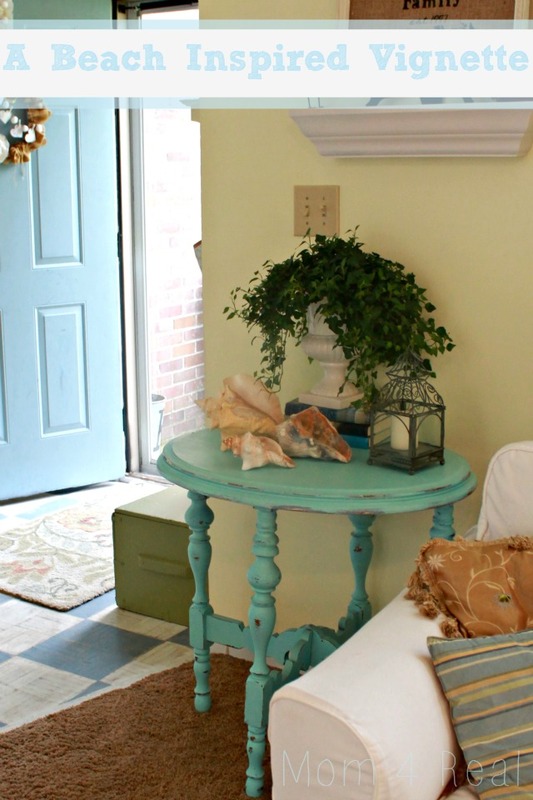 I so love “beachy” vignettes and yours is terrific! 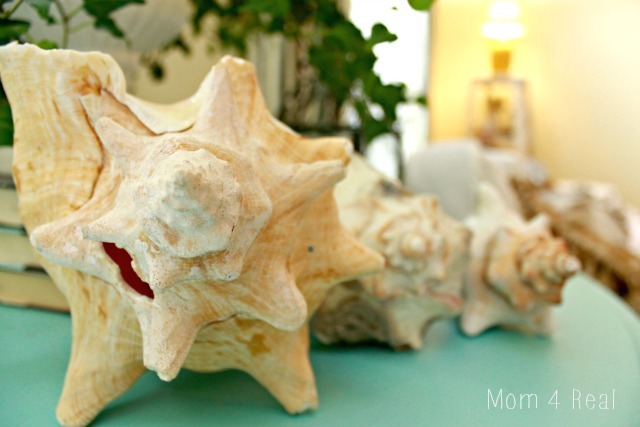 !…Great conch shells!! Hi Jessica! I love your vignette. I pinned it to my coastal decor board and will be featuring it tomorrow! Thank you so much, Kim! You are too sweet!